A roundhouse wall, with the help of James, Roland and Alistair, turned into something rather unexpected. Finding both inner and outer ‘skins’ of the 1.5m upstanding wall was pleasing, however, overall thin revetments on both sides and an inner core did not make as substantial a structural integrity as one could expect. The core of the 4m thick wall was filled with quarried angular sandstones up to 30cm in diameter having neither any placing order, nor a substantial amount of joining matrix. 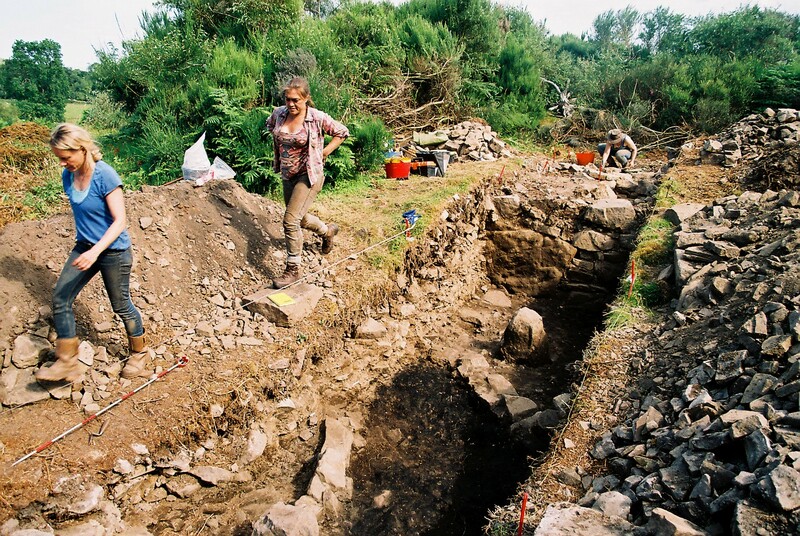 Interestingly, the nature of the wall did not seem to resemble structural patterns found in the duns across the peninsula where walls having robust outer skins are filled with rubble and earth mixture. At the same time, it did not make a broch-like structure where a disciplined placing of the stones is supposed to play a key role in keeping the walls rigid and stable all the way through. This enigmatic point undoubtedly requires further in-depth investigations in order to understand the nature of the structure’s morphology. 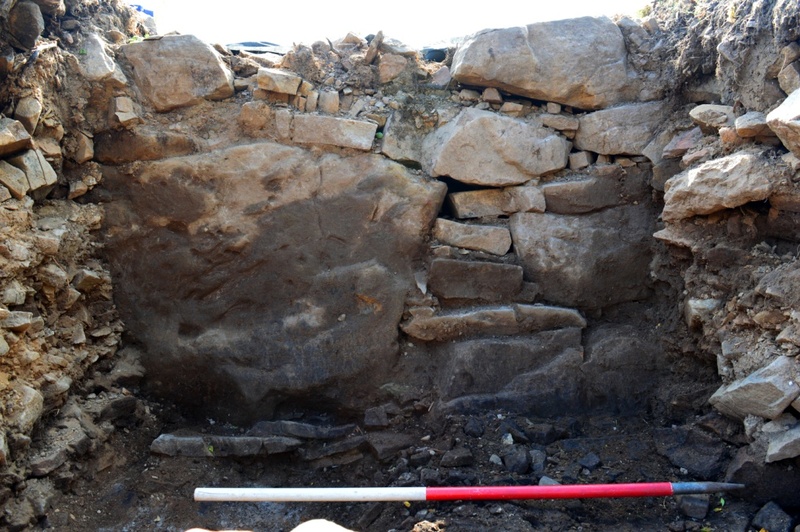 Picture showing uncovered roundhouse wall. The area in between the roundhouse wall and the enclosure wall has provided evidence of activities associated with the surrounding structures. At first, I shall point out that it is difficult to make sense of the incomplete features having only an evaluative trench 2m in width. Within the area, two low-base stone walls (up to ~50cm) were intersecting the trench. 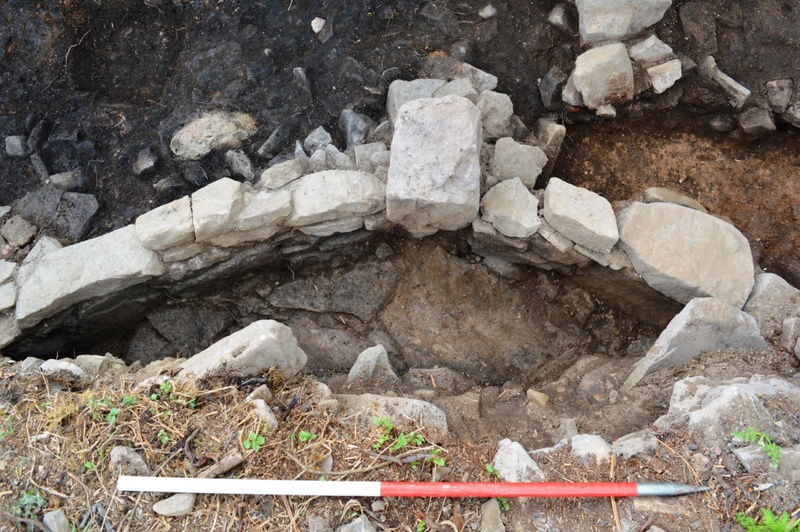 One of the walls seem to make up a segment of potential circular building which has a meticulously laid flagged floor, on which a thick layer of turf having charcoal inclusions and a fragment of ceramic mould/crucible was directly deposited. Evidently, the walls did not seem to be any much higher when they were originally built. The area in between the walls contained series of abandonment and demolition deposits rich in charcoal and daub abutting the walls. Here, within the last excavated occupation horizon a round red sandstone mortar was found. In front of the roundhouse wall investigative sondage was located over the cobbled surface half-sectioning the monolith feature. 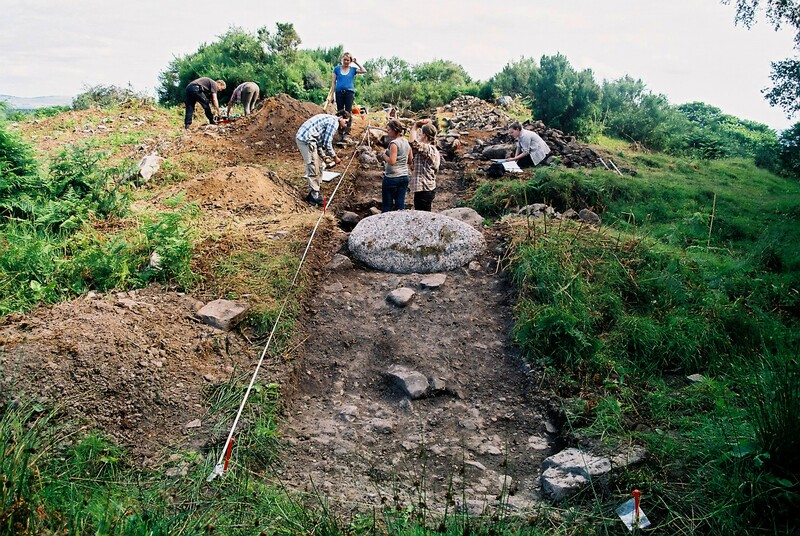 While dating material was obtained from underneath of the roundhouse wall, the monolith kept providing more and more questions regarding its position and more interestingly, functionality; the shaped-stone was set in a ~30cm cut and packed with angular stones 1.7m away from the roundhouse wall. The enclosure wall, mainly dug by students, has shown an interesting progress of the wall maintenance. 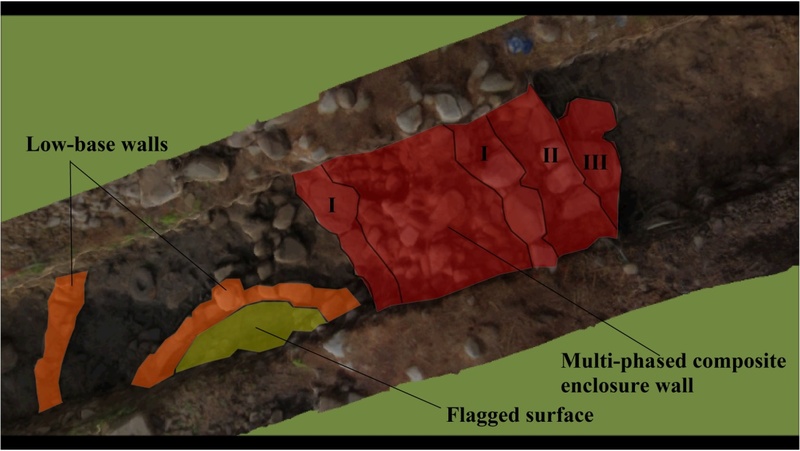 The composite wall with rubble and earth core has provided evidence of three phases: the original construction stage and two being serious repair events of the outer revetment. 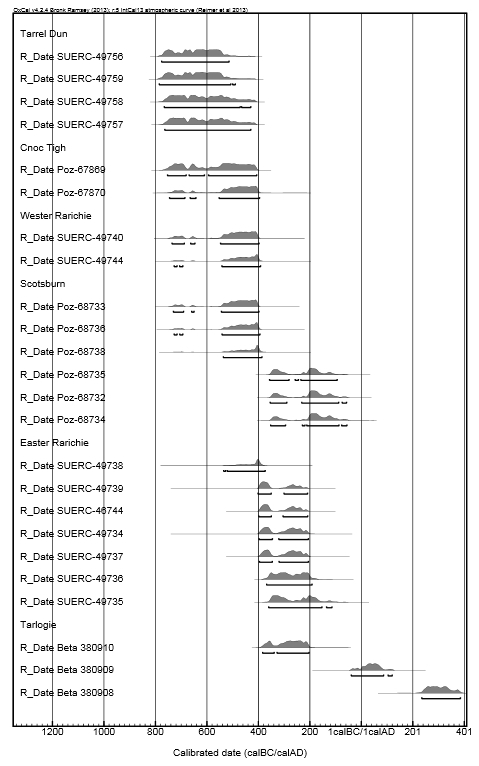 For the purpose of dating the enclosure wall, a sample of underlying deposit was taken for analysis. 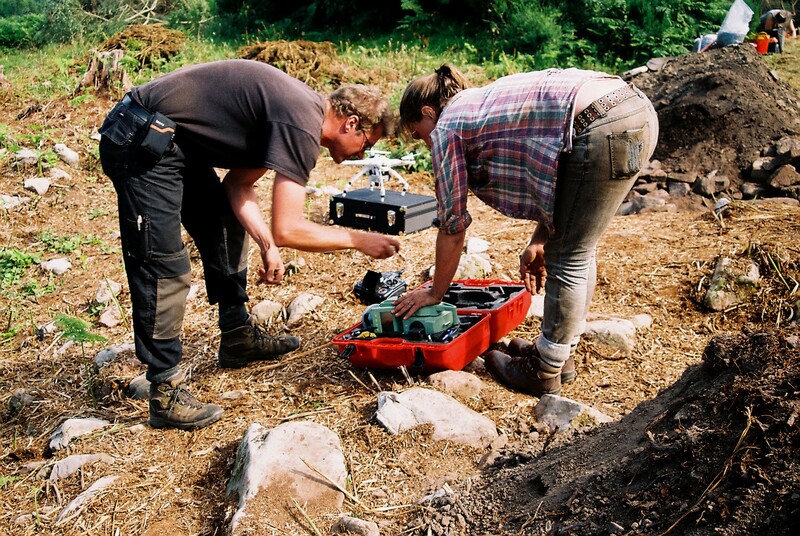 Further away northwards, Leaf and James have been blunting their trowels excavating a metalled surface – a very(!) compact deposit containing small sub-angular pebbles set in the silty sand. Evidently, this passage between the enclosure wall and the first earth bank served as a road surface, which has clear indications of maintenance episodes happening at the time when the road was in use. Continuing down the trench, two earthen banks with ditches in between were excavated placing 1m sections along them in order to attain a cross section perspective and better understand how they were created. On the side facing the metalled road, the first bank had a straight nicely-laid revetment face supporting the bank. On the other side, a ditch was cut ~40cm into bedrock, which was used to pile up both of the banks. The excavated banks show evidence of consolidation with stones at their bases and re-deposited turf on the sides. The trench has been completely backfilled retaining the original curvature of the earthworks. While digging in the 2m x 26,8m box, a great number of features were unveiled. Undoubtedly, this just hints how much is to be revealed! In a couple of months, after the post-excavation process, a full vegetation clearance and an extensive topographic survey, the story of Scotsburn dun/broch will be told with much finer detail and hopefully that will answer enough of our questions to allow us to further interrogate this site and its environs by asking even more provocative ones. And finally, many great thanks for EVERYONE who has been involved in this excavation! It still keeps me smiling remembering those mattocking days! 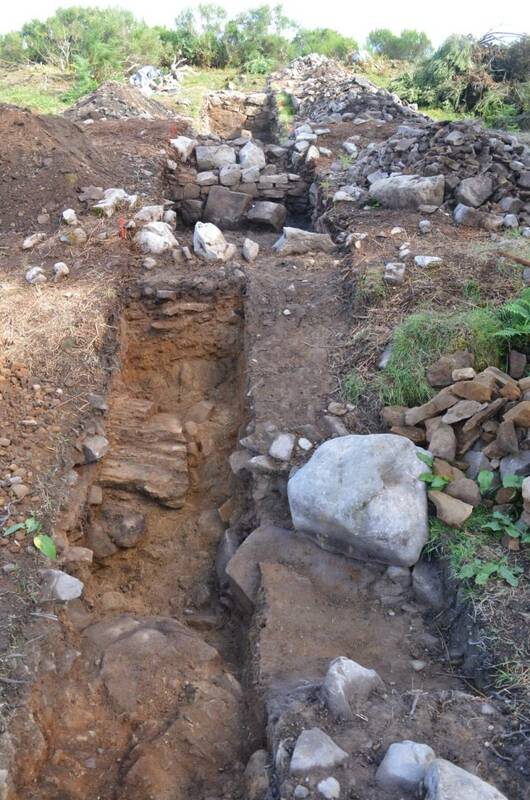 See also our first post on the Scotsburn excavation, including discussion of the possible stone mortar. Vaidutis, many thanks and congratulations on making a complex site and detailed excavation come alive. Your photographs, aerial shots and video reconstruction in particular are brilliant.